Each year, our staff raise money to donate to charity. In return, they get to dress down at certain times throughout the year! As you can see in the photo, our team proudly presented a $500 check to our 2017 charity of choice—the Indiana Women In Need Foundation. 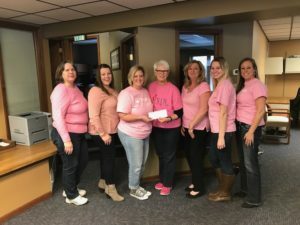 The IWIN Foundation supports women who are currently fighting breast cancer in Indiana.